Why is no one questioning the TURC narrative? The case of Johnny Lomax and the Trade Union Royal Commission shows how this process can go wrong. While the Trade Union Royal Commission has raised legitimate concerns about union governance, it’s extraordinary how weak some of the evidence is and how willing the media is to ignore counter-narratives, writes Stephen Long. Twenty one years ago Johnny Lomax – player of the year for the Canberra Raiders – was suspended by the rugby league judiciary for a high tackle and rubbed out of the 1994 grand final. 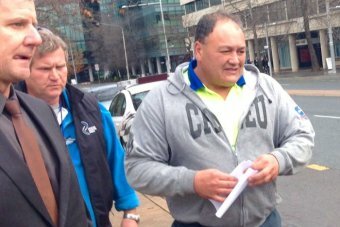 He suffered a better fate in the ACT Magistrates Court on Monday: it threw out absurd criminal charges the Australian Federal Police had pursued against Lomax on behalf of the Trade Union Royal Commission. Lomax’s “crime” was to seek better pay and conditions for workers under an enterprise agreement with their employer. The “loss” alleged by police was that the company would have to pay its workers at least $26 an hour under the enterprise agreement, rather than the $17 the employer claimed it might otherwise pay (a wage which was, in fact, below the relevant award minimum). Lomax told the subcontractor, in a phone call, that his company might struggle to get work on building sites if it didn’t have an EBA; a statement of fact, since most enterprise agreements with principal contractors contain clauses requiring subcontractors to pay industry rates. Somewhat apologetically, the ACT Director of Public Prosecutions wrote to Lomax’s lawyers this month saying it would “offer no evidence” when the case went to court – conceding, in effect, there was no case to answer. A waste of taxpayers’ money, a waste of time, and an extraordinary overreach by the AFP and Dyson Heydon’s royal commission. Yet it occurred to few reporters covering the Trade Union Royal Commission to question the tactics. To publicly ask: should a union organiser be arrested and charged for doing his job? To ponder whether it was a stretch, even a dangerous precedent, to equate hard bargaining over pay and conditions with blackmail. To say: isn’t it more appropriate to deal with such issues through workplace relations law? There is no doubt the Trade Union Royal Commission – or the TURC, as it’s become known – has raised legitimate concerns about union governance, and exposed corruption (including another organiser in Canberra who allegedly hit up employers for wads of cash). At a cost to the taxpayer of roughly $80 million, one would hope the royal commission would do so. It goes without saying that the exposure of corruption is welcome: any union official who takes bribes or misappropriates funds should face harsh punishment. But it’s extraordinary how weak some of the evidence trumpeted at the commission is; how dubious the conduct of some of the companies lionised at the commission; and how willing the media is to ignore counter-narratives. At the hearings, there’s been a parade of dodgy builders with poor safety records or serious question marks about their treatment of workers. One of the star turns in the early stages was Lis-Con, a concreting contractor employed on major infrastructure jobs in Queensland including the Brisbane Airport Link tunnel. Counsel assisting the commission, Jeremy Stoljar, portrayed Lis-Con at the hearings as a company “forced out” of Queensland by a thuggish union campaign. A simple internet search shows that Lis-Con was, at the time, in a protracted dispute with the Queensland Government over an alleged $5.2 million underpayment of payroll taxes – which the company claims had nothing to do with it exiting the state. And the company has also been subject to allegations of gross worker exploitation. In an affidavit provided to the royal commission, an Irish backpacker alleges tactics at Lis-Con as shameful as those at 7-11: migrant workers housed two or three to a bedroom, on couches and on the floor in “Lis-Con houses”; workers systematically underpaid; subjected to bullying, intimidation, standover tactics and unsafe work practices; hired as sham contractors; paid in ways that illegally sidestepped visa requirements; and told that if they joined the union, they’d get the sack. A Lis-Con representative rejected some of the allegations, while others went untested at the royal commission. The affidavit form the whistleblower is publicly available, though Dyson Heydon considered it outside the terms of reference and declined to call him as a witness. Yet, as far as I can tell, no reporter from the mainstream media has covered it or investigated the allegations. By contrast, months of damaging headlines and reports followed the revelation that employees at an industry superannuation fund, CBus, had given details of 400 Lis-Con workers to the CFMEU. The essential context was all but ignored: that Lis-Con companies were three to four months in arrears in superannuation payments and owed workers close to $650,000 in unpaid entitlements. I know it’s an unfashionable point of view, but shouldn’t we be more concerned about a company underpaying superannuation to the tune of hundreds of thousands of dollars than by a super fund giving information to a union that wants to get that money paid? Back in Canberra, weeks after the arrest of John Lomax, new light was shed on the conduct of aggrieved local builders who’d been feted at the commission. Photographs of serious safety breaches on building sites were presented in evidence. In cross examination, builders put up their hands and conceded wrongdoing. One had already confessed to losing his scaffolding license for a period after an apprentice was injured on one of his jobs in 2013 and, more recently, to being issued with a prohibition notice because of serious safety hazards. To put this in context: Canberra’s construction industry has one of the worst safety records in Australia. A report three years ago, commissioned in the wake of three fatalities, found its serious injury rate was 31 per cent higher than the national average and its long term injury performance 50 per cent worse than most Australian jurisdictions. On average, a construction worker in Canberra gets injured every working day. None of this fazed Jeremy Stoljar. The counsel assisting the royal commission re-examined the building company witnesses and appeared to downplay the concerns. A royal commission is not a court. It is an arm of the executive government. With rare exceptions, such as the child abuse royal commission, most recent exercises of this kind have been blatant in their political motivations – this royal commission perhaps more than most. Latika Bourke’s revelation in the Fairfax newspapers that Commissioner Dyson Heydon had agreed to speak at a Liberal Party fundraiser shifted the narrative, leading the media to focus, briefly at least, on the politicised nature of this inquiry. The expose by Pamela Williams in The Australian that the commission treated with kid gloves the corrupt former HSU official Kathy Jackson – a darling of the right – reinforced this perception. Too many journalists have been willing to passively receive the narrative as laid down by the royal commission. Of course, journalists will report sensational allegations from the TURC – there’d be something wrong if we didn’t. But some might say it’s a star chamber. Knowing this, don’t we, as journalists, owe it to the public and our craft, to treat the evidence sceptically, probe the bona fides of those airing the allegations, and form some independent narratives out of this inquiry? Stephen Long is an investigative reporter with the ABC, covering business and finance.